Albondigas [Ahl-bohn-dee-gahs]. Loose translation? 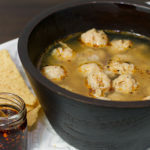 Mexican meatball soup. Many Mexican states (and other Latin American countries) have different varieties of this soup. And in Durango, where my family is from, our variety is made up of ground chicken, rice, onions, garlic (duh!) and a minimal amount of spices. 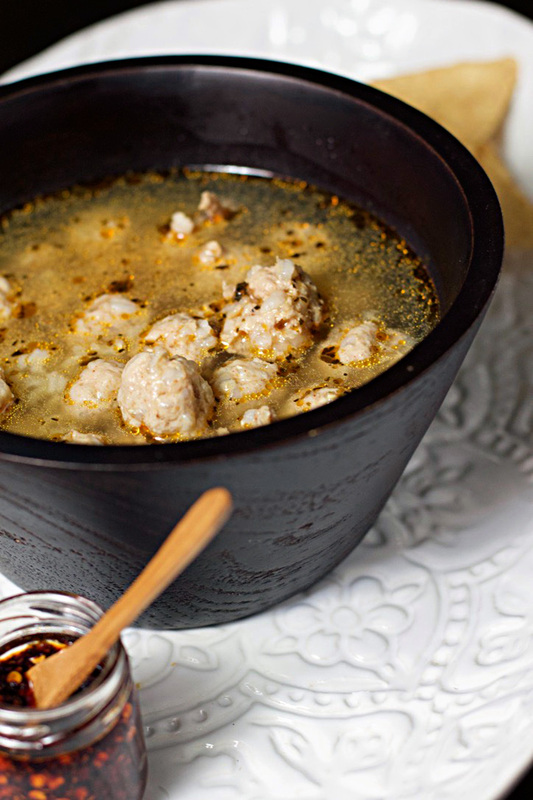 Ever since I could remember, albondigas were a staple in my home. My mom has spent countless minutes perfectly seasoning, then carefully rolling each meatball. And it has not gone unnoticed. I’m not sure when this recipe came into my family’s repertoire but my mom remembers that her mom used to make it. I’d like to think that this recipe has been passed down, inadvertently, for generations. If I come to think of it, food is the only inheritance we’ve ever had. Jewelry, houses, clothes, and actual monetary inheritances are virtually nonexistent in my family. Some would find that disappointing, and after my grandmother died and I wasn’t able to own one of her rings of that I used to admire as a child, I would’ve agreed. But coming full circle in this thing called life, I realize that recipes and food are better. Is there anything more sacred than putting time, patience and care into a meal for your loved ones? The smells of your favorite dish evoke a feeling of nostalgia and longing for the fleeting moments when you broke bread with special people in your life. Inviting people into your home to share those moments is one of my favorite things. And that is also an inheritance. In Mexico, everyone knew that if they were passing through my grandparents town, that they had a warm meal and plenty of love waiting for them at Doña Lilia’s house. So, this is why I know that every time my mom makes albondigas, she’s honoring my grandmother and hers. Every time I make it, I’m honoring all of them. And anytime you make it, you’re honoring the love, food and tradition that holds families together for generations. That’s something much more significant than any material possession. This hearty soup is nothing short of amazing. It’s comforting, warm, and will provide sustenance during these cold winter months. Honestly, it tastes better day two or even three. I know some people don’t like leftovers, but if you’re ever going to make an exception, do it for this dish. The flavors of oregano, garlic and onion mix together so perfectly and the rice helps create an almost creamy consistency. The best part? Completely gluten-free. I know how hard that is to find so here’s a great alternative for all my GF people! If the ingredients seem a bit skimpy, feel free to top it with sliced avocados, chopped raw onions, cilantro, tortilla chips (or tostadas), or Beanitos chips (I love the “Skinny Dippers” variety). If you find some other topping that works, let me know in the comments below. Always up for new ways to reinvent my recipes. Feeling sick? Or just plain sick of chicken noodle soup? This delicious alternative will warm you from the inside and give you all the feels. Cook 1-1/3 cups of rice (will be used to help bind the meatballs) by combining 1 1/3 cups of uncooked rice with sea salt and filtered water. Cook for approximately 30 minutes. If it’s not fully cooked keep checking every five minutes or so (this is the case for brown rice only). Ground up chicken thighs in food processor or blender until completely mushy (I know that’s a gross word). Add garlic cloves to chicken thighs in food processor and grind some more. Mix chicken thigh/garlic with all cooked rice in a bowl, along with onion and spices. Make 1/2 inch meatballs out of mix by rolling in your hands. Put finished meatballs in a 8×8 baking dish. Add oil to 6 quart pot and 1-1/2 cups of chopped onion. Cook until translucent. Add garlic and cook for a minute. Then add water and spices (except for oregano). Bring to a boil. Take meatballs over to soup and with a cooking spoon, add soup to meatballs until meatballs change color in baking dish. By doing this before putting them in the pot with the rest of the soup ingredients, you’re cooking them on the surface a little in order to ensure that when you put them in the pot, they don’t break apart. This way, they keep their shape. Add meatball and soup mix to the pot along with 1 cup of uncooked rice. You can cover the soup to bring to a boil faster, but be sure to monitor it so you don’t overcook. Once it’s boiling, reduce heat to low and cover (if not already covered). Let the soup cook on low for 45 minutes. Either 10 minutes before soup is finished or once the 45 minutes are up, add 1/2 tsp of dried oregano and stir. Garnish with more oregano, if desired. Add your favorite salsa for an extra kick and some sliced avocado. Tortilla chips or Beanitos taste great with it too! Your blog flooded me with emotions and memories of cooking with my grandmother! I totally asked my mom to make this dish this weekend!